Marine Ports Learn more about the Container Terminal (MultiRio) and Vehicle Terminal (MultiCar) at the Port of Rio de Janeiro. 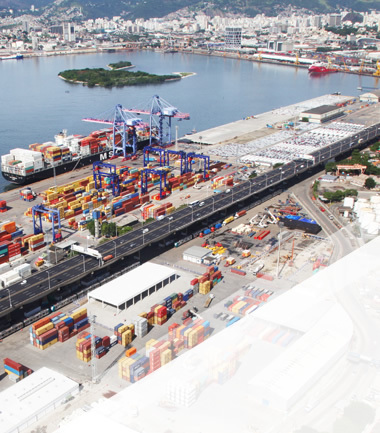 Dry Ports Learn more about the Bonded Industrial Logistics Center in Rio de Janeiro and Dry Ports in Resende (RJ) and Juiz de Fora (MG). Integrated Logistics Learn more about some projects integrated logistics and door-to-door, PDI, just-in-time, among others. We cover every step of the supply chain to undertake a 360 Degree Logistics. MultiRio Container Terminal at Rio de Janeiro (RJ) Port. MultiCar Vehicles Terminal at Rio de Janeiro (RJ) Port. * Improve continuously the Integrated Management System performance. Multitermiais partnered with the Gerdau group on the steel project in the city of Ouro Branco – MG. Multiterminais participated in all stages of the logistics process of this huge operation. The logistics process, from the import of parts, until the delivery to the Mercedes-Benz factory in Juiz de Fora is made by ALB. ALB is a joint venture between Multiterminais and Schenker International, one of the largest freight forwarders in the world. © COPYRIGHT MULTITERMINAIS • All rights reserved.